It all begins with an architect. Michael Caine as Leonardo DiCaprio's character's architecture professor in Inception. Leonardo DiCaprio’s lead character in the film, Inception, used to be an architect. But now, sometime in the near future, he’s an Extractor. He can enter your mind through dreams and see your subconscious and thereby know your deepest secrets and inner-most thoughts. It is up to the Architect of the dream, played by Ellen Page (Ariadne), to create the built world of the dream. The idea of inception (and don’t worry, I’m not going to give any spoilers) is to plant the seed of an idea in a person’s subconscious, but in order for the idea to take root, it must be in the simplest form, and if the Extractor can do that, then the idea can grow, organically in the person’s mind when they awake. From the first scene in the movie, I knew I was going to have to write about it. That first scene takes place as Leonardo DiCaprio’s character, Cobb, is escorted into a Japanese dining room. The first shot we see of this room includes a view of the back of a large half-circular chair with lattice work design at the head of a table, lined along the sides by a dozen or so, smaller, half-circular chairs with vertical rails. The lattice work style chair, whose back is to the audience in that first scene is a chair designed by Charles Rennie Mackintosh in 1903, called the Willow Chair. Mackintosh's Willow Chair, designed in 1903 for The Willow Tea Room on Sauchiehall Street in Glasgow, Scotland. The side chairs were designed by Frank Lloyd Wright, in 1937, for the Johnson House, called Wingspread in Racine, Wisconsin. That these two chairs, designed by a Scot and an American, fit into a Japanese setting, is of no surprise. Both Mackintosh and Wright were greatly influenced by Japan, its architecture and design. The elegant simplicity and minimal decoration of Japanese design was admired and copied by both of these architects. Even the light fixtures, both in the Japanese dining room and in the main hall (as seen in later scenes, and below) contain light fixtures that are unmistakably Japanese in style, but appear much like fixtures by Mackintosh. Leonardo DiCaprio stands in the main hall of a Japanese house under Mackintosh style lighting fixtures. Notice the similarities in the lighting fixtures between the Japanese house above and those in The Hill House, designed by Mackintosh in 1903, below. Gabriele Fahr-Becker, talking about another building by Mackintosh in Art Nouveau (Könemann: Germany, 1997) stated, “The Glasgow School of Art, Mackintosh’s most famous building, belongs to architecture and architects, or rather to building and the future. This manifesto of simplicity, warding off all false pomp with its block-like, self-contained composition, has become a model for future generations of architects.” (p.53) I like thinking of this quote in relation to the dream architect of the movie. Interior view of the main hall with light fixtures at Mackintosh's Hill House, 1903. The light fixtures in the library at The Glasgow School of Art, 1909, are modern interpretations of the more traditional cluster of lanterns that hang above the table in the Japanese dining room in the movie. And since we seem to be covering all 20th century architects that were influenced by Japanese design, it only seems appropriate to include California’s Greene and Greene. Charles and Henry Greene were also influenced by the elegance and simplicity of Japan, although their work tended to focus on the craftsmanship rather than the functionality of Mackintosh and Wright’s works. And while I tend to think that Mackintosh and Wright looked more to the future and rejected Historicism more than Greene and Greene, all four men held true to their shared beliefs in simplicity, unity and nature. Freeman Ford House, 1909, by Greene and Greene. It is so perfectly fitting, then, that the former Architect, Cobb, and his wife share a house outside of Los Angeles, that was built by Greene and Greene. This house, the Freeman Ford House, is a metaphor for the beauty of simplicity in design and in the dreams of Inception. Cobb may appreciate the house’s simplicity as a former architect, but he can also see the necessity in the simplicity of ideas. 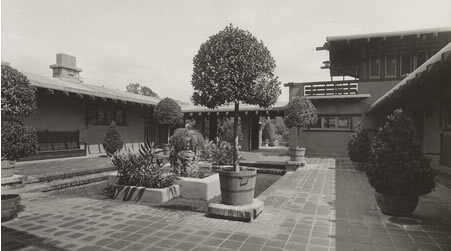 While Pasadena is proud to claim the Freeman Ford house for it’s own, there are not many interior photos of it available online. But it’s characteristics are similar to those in many other Greene and Greene houses. This window, actually at the Ford House is a common design element, horizontal bands of windows with stained glass. A window like this is visible in the scenes that take place in the Cobbs' dining room. This interior image is of Greene and Greene's most famous residential structure, the Gamble House, 1909. The image of the Gamble House above shows the dominance of woodwork in the interior and the use of low ceilings and constricted space opening up into larger rooms and more open space. We got to experience this every time Cobb walked down the long, narrow corridor to his dining room that looked out over a large backyard. Another area of the movie Inception that I want to mention is the music. I can’t talk about the musical theory behind it, but as I was watching the movie, in the theater, the soundtrack blew me away. It was those two deep beats played by an ear-piercingly loud horn every time it was all about to go to Hell, that made me jump and stay on the edge of my seat. I found an interesting article about how those two notes mimic the two notes played in the Edith Piaf song used to wake the dreamers, “Non, Je Ne Regrette Rien.” The music is by Hans Zimmer and it’s brilliant, not only in its ability to captivate but in the symbolism of a song about no regrets being used for a movie about continuously re-living dreams. There’s something about the music (and this whole movie) that reminds me of Vertigo (or maybe it’s the cymbals in The Man Who Knew Too Much), which just makes me love it all the more. One of the main characters in the movie is named Eames. Charles and Ray Eames are two designers and architects that I mention the work of often. Here is Cobb, with Eames, played by Tom Hardy, in Inception. Here is Cobb, the former Architect, and Ariadne, played by Ellen Page, the new Architect. Every time I saw her on screen, I couldn't help but think, "note to self: wear scarves more often and study architecture in Paris."